In the second part of this step, we took Front vowel sounds that we knew (’cause they are used in English) and modified them (by adding lip-rounding) and created non-English vowel sounds. In this post we’ll do a similar process with English Back vowel sounds. 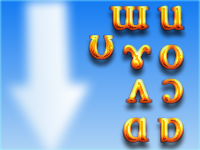 It will be similar because these vowels also come in pairs, though the English back vowels we’ll be looking at are rounded, and we’ll make the non-English vowels by UNrounding them. It’s worth noting, I think, that some speaker of English have far more back vowels than others, as they might not merge Lexical Sets in their dialect in the same way that you or I might (that’s assuming that you and I share the same dialect). So, for instance, in my dialect the lexical sets palm, lot, cloth, thought are all pretty much the same, with a few exceptions, like words that end in "-ong". So if I say "I thought you wore a thong, those words don’t sound alike. For me, thought is unrounded and fully open, while thong is slightly rounded and mostly open. For the sake of this exercise, we’re going to work from versions of vowels that might be familiar to those who can speak a "Standardized Accent", like General American or Standard British, aka Received Pronuniciation. So far we have looked at the Close Back vowels [ɯ u] (when we first worked with non-English sounds here.) To remind you, [u] is the vowel in the lexical set goose. [ɯ] isn’t used in English, though it is a vowel in Vietnamese, and it’s used as a contrast with [u]. foot [ʊ]: In North America, this vowel is frequently said with very little lip rounding and more centrally. goat [o]: Again, in North America, we often don’t round our lips much. Use Scots dialect as an example, round your lips aggressively, and make a "pure /o/" sound, not letting if slide off into a diphthong. strut [ʌ]: The IPA has this symbol representing a very far back sound, though in English we typically use the symbol to represent a fairly central sound, quite close to the sound represented by [ɐ]. To get the "Cardinal Vowel" sound for [ʌ], we’ll have to make a much more "back" sound, close the way a Texan might say "luck, love, mother." thought [ɔ]: This sound is perhaps more easily done for people with British accents, as the well rounded, very back sound of /ɔ/ is more familiar. In RP, this vowel is heard in north/force sets as well as in the thought lexical set. In some accents, cloth is merged with thought on this vowel. palm [ɑ]: I tend to avoid using the word "Palm" for this lexical set, as so many North Americans either say the /l/ sound in the word, or they let the "idea" of the /l/ sound affect the vowel, making it into more of a /ɔ/ sound. Instead, I tend to use the word "father" in its place. lot [ɒ]: This slightly rounded open vowel appears in some accents, and the lexical set lot is fairly easy to identify, as so many of the words in the set are spelled with the "short o". In many accents cloth is merged with lot on this sound. So what’s left that’s non-English? We have really only got one new vowel here: [ɤ]. This is the unrounded equivalent of [o]. To make it, you need to start with a well-rounded "pure" /o/ vowel. From there, spread your lips wide, so you hear the most drastic difference between [o] and [ɤ]. Now try applying the unrounded close-mid back vowel (that’s the name for [ɤ]) to some words: "home, toe, rope, globe" all the while keeping your lips slightly spread. Let’s compare the other cardinal back vowels in a similar manner, going back and forth between the two sounds, locking into the rounded version and then unrounding to make the other vowel. You want to feel like your tongue is motionless in the position you choose for the first vowel, and merely let the lips shaping dictate where the vowel sound goes. Try not to adjust to where you think the unrounded vowel is "supposed" to go. We’ll also add the "close" pair back into the mix, so we can contrast them all. Go back on forth on each pair, to really feel the sound/position of the sounds in relationship, and stick to one pitch so that that doesn’t distract. Start with the goose vowel [u], and spread into [ɯ]. On to the contrast between thought and strut: round strongly, so you have a "hollow cheek" feeling as you say [ɔ] and then keep you tongue where it is while you spread your lips into a very far back [ʌ]. Finally, start with the rounded open back vowel of the lot set, [ɒ], and relax the lips into the unrounded open back vowel of father/palm [ɑ]. The only Vowel sounds left to explore are the "Central" vowels. 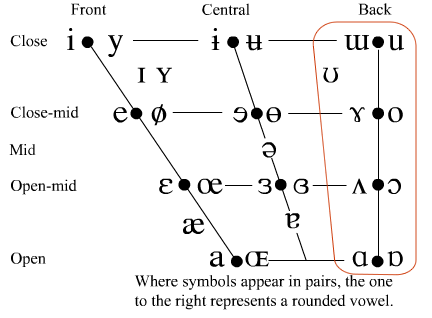 I recently read in John Wells’s Phonetic Blog that the non-English "Central" vowels are, according to him and his colleagues at University College London, vowels that they don’t really teach or test as part of the IPA Stream of the Summer Course in English Phonetics. Regardless of whether they are worth knowing or not, we’ll explore them in the 4th part of non-English Sound Exploration.